Hereditary Leiomyomatosis and Renal Cell Cancer is a very rare genetic condition that was named in 2002. This HLRCC Science section has been created to help people understand the technical research side of HLRCC. HOW DO CHANGES IN DNA CAUSE CHANGES IN FUMARASE? How Do Mutations in Fumarase Cause Cancer? If your genetic test results show that you have an alteration in your fumarase gene, you may have questions about what the letters, numbers, and symbols that describe the alteration mean. You may also wonder how changes in the DNA of your fumarase gene interfere with the making of fumarase in your cells. Fumarase is an enzyme, meaning it is a protein that catalyzes chemical reactions. DNA is the code for making proteins. Proteins are like strings of beads in which the beads are amino acids. Proteins have 20 different kinds of beads–they are the 20 amino acids. DNA provides the code for putting the amino acid “beads” in order. DNA is found in the chromosomes. In the pictures we see of chromosomes, they look a bit like worms that have been pinched in the middle. That is because the picture is taken at a time when the DNA (and the proteins surrounding it) is all coiled up. At other times it is stretched out and is like a very long filament. The DNA filament can be thought of as a double-stranded string of beads. The two strands only have 4 kinds of beads–they are the nucleotide bases, symbolized by the letters A, T, C and G (adenine, thymine, cytosine and guanine). Along the length of this double strand, the beads are paired up so that A of one strand is always connected to T of the other strand, and C is always connected to G.
DNA is used as a template to make messenger RNA (mRNA), which is more directly involved in the assembly of protein. mRNA can also be thought of as a “string of beads”. Like DNA it has 4 kinds of beads. Three of them are the same as in DNA (A, C, and G), but in place of thymine (T), mRNA contains uracil (U). mRNA is single-stranded, so the beads are not paired. However, in the process of making mRNA from DNA, the attraction and pairing of the beads is important. Wherever there is an A on DNA, a U will be placed in the mRNA strand that is being assembled on it. Likewise, a T codes for an A, C codes for G, and G codes for C. The process of making mRNA from DNA is called transcription. During transcription, the DNA strands separate at the point where transcription is taking place, and only one strand of the DNA is used. The corresponding mRNA beads are lined up and joined together on that strand of DNA. Later, the newly formed strand of mRNA is separated from the DNA template, and the two DNA strands reunite. The new strand of mRNA is complementary to the DNA strand that made it. For example, a DNA sequence of ATCGTTACC would result in an mRNA sequence of UAGCAAUGG. mRNA is the direct code for proteins. It dictates the sequence of amino acid beads that will be lined up and connected to make a protein in a process that is called translation. Every 3 RNA beads codes for an amino acid. This nucleotide triplet is called a codon. Since there are three beads in a codon, and there are 4 different kinds of beads in mRNA, there are 64 different 3-letter combinations to code for 20 amino acids. (See the charts at the end of this section.) Therefore some amino acids are coded for by more than one 3-letter combination. Three codons are nonsense codons, meaning they code for nothing. They are used as stop signals. One codon, which codes for methionine, is the start codon. It signals where translation is to begin. So you can see that if there is a change in the sequence of DNA beads (mutation) there will be a change in the sequence of mRNA beads. Sometimes the change will make no difference in the protein that is made. For example, if UAU on the mRNA strand is changed to UAC, there will be no change because UAU and UAC both code for the amino acid tyrosine. However, if UAU on the mRNA strand is changed to CAU, then histidine will be put where tyrosine is supposed to be. This is called a missense mutation. A missense mutation is one that causes a different amino acid to be put in place of the correct one. Sometimes, instead of a substitution, a mutation can cause protein making to come to a halt. For example, if UAU is changed to UAG, it will code for nothing because it is a stop codon. This is called a nonsense mutation. Enzymes that have had only one or just a few of their amino acids changed can sometimes still function, depending on whether the amino acids are located in a position on the enzyme that is important or not. Nonsense mutations, which stop the protein making process and lead to truncated proteins, are more likely to cause problems. Many details were left out of the above explanation so that the understanding of how DNA codes for mRNA, and how mRNA, in turn, codes for the sequence of amino acids that makes up a protein would be easier to comprehend. Just a few of these details will be added here. There are actually several different kinds of RNA. In addition to mRNA there is another type of RNA, called transfer RNA (tRNA), which brings the amino acids to the mRNA during the assembly process. There are many different forms of tRNA, each one with a particular amino acid attached to it. Each tRNA has a binding site that can attach to the mRNA. That binding site is called the anti-codon and consists of three nucleotides that are complementary to the mRNA nucleotides. For example, if a section of mRNA is being used to make protein, and the next three nucleotides are UAC, the tRNA with the anti-codon AUG will attach to those three nucleotides and that tRNA will have the amino acid tyrosine attached to it. Tyrosine will then be added to the growing chain of amino acids. There is a third kind of RNA called ribosomal RNA (rRNA) which, with the addition of some proteins, forms a ribosome. A ribosome attaches to a strand of mRNA at the point at which protein making will begin, and then moves from codon to codon providing a framework for the amino acid assembly. Transfer RNAs reach the mRNA by entering the ribosome, and then the ribosome attaches the amino acids to each other. The ribosome moves down the mRNA strand much like a car on a roller coaster, and, as it does, a growing chain of amino acids, called a peptide, emerges from it. DNA is a double-stranded helix. When it is used as a template to make mRNA, the two strands are first separated at the point where transcription will begin, and then just one strand is “read” or transcribed to make the mRNA. This strand is called the template strand. One might think that the template strand would be the one used when DNA sequences are reported, but it is not. Instead it is the conventional practice to report the sequence of the other strand of DNA, which is called the “coding DNA”. The reason for this is that, since coding DNA and mRNA are both complementary to the template DNA, their sequences are almost identical. The only difference is that wherever there is a T for thymine in DNA, there is a U for uracil in mRNA. Researchers find it less confusing to use DNA sequences and mRNA sequences that are nearly alike. The “c.” that precedes numbers in the mutation database stands for “coding DNA sequence”. This is so that it will not be confused with the other DNA strand which, in fact, actually serves as the template for mRNA. (There are other sequences with which it could be confused as well.) In the charts that follow, you will see the coding DNA and template DNA sequences that code for the mRNA codons. The mRNA codons code for the amino acids. This is accomplished by transfer RNAs that each have a particular amino acid attached. Only the transfer RNA with a nucleotide triplet (anti-codon) that is complementary to the next three nucleotides on the mRNA strand (codon) will be brought in and temporarily attached to the mRNA. The amino acid that it brings with it will be added to the growing chain of amino acids which form a peptide. Proteins are not always just simple peptides. Often, after peptides are made they are joined together and twisted into shape to make protein subunits. The subunits combine to make the finished protein. Fumarase is made out of four identical subunits that are put together (a homotetramer). The subunits are coded for by the fumarase gene, which is located on chromosome 1. (The precise location is 1q42.1, meaning that it is in sub-band 1 of band 42 on the long arm (q) of chromosome 1.) The fumarase gene consists of more than 22,000 nucleotide base pairs. Not all of these base pairs are used to code for the amino acid sequence of fumarase. There are 10 sections of the gene that are used, and they are separated by much larger intervening sequences that are not used. The parts that are used are called exons, and the parts in between are called introns. After the messenger RNA is made from the DNA, the intron portions of the mRNA are cut off and the exon portions are joined (spliced) together to form one long chain that is then used to make fumarase. The exons of fumarase are numbered 1 through 10. Each of the introns is given the number of the exon that precedes it. Changes or mutations found in introns that are located close to exons may sometimes cause incorrect splicing of the mRNA, which leads to incorrect proteins being made. Most of the mutations of the fumarase gene that are known to cause HLRCC are located on one of the 10 exons. However, there is one splice site mutation which is located on intron 2 that is recorded on the TCA Cycle Gene Mutation Database. There are also 5 more splice site mutations reported in a recently published paper from France. Most genetic screening only looks for mutations in the exons plus the portions of the introns that are located near the exons. When cells divide, the chromosomes containing the DNA divide so that half the DNA goes to each of the two new cells. Later, each cell replicates the DNA it has received. During this process of cell division and DNA replication, mistakes can be made. Mistakes can also occur when DNA is damaged by radiation, sunlight and chemicals. Often the cells can repair damaged DNA, but as we get older our repair mechanisms don’t work as well and mutations can accumulate. There are many different types of mutations that can occur. Sometimes a different nucleotide is substituted for the correct nucleotide. This is called a substitution mutation and is denoted with the symbol >. For example, if the nucleotide thymine was put in the sequence where cytosine was supposed to be, it would be written as C>T. Sometimes a nucleotide may be inserted between two nucleotides. This is called an insertion and is indicated by “ins”. Sometimes a nucleotide is accidentally removed from a sequence. This is called a deletion and is indicated with “del”. These three types of mutations are called point mutations because they are caused by changes in a single nucleotide. Some mutations involve more than one nucleotide. For example, deletions may involve the omission of several nucleotides. In some cases, an entire exon or even a whole gene may be deleted. Another type of mutation that can involve many nucleotides is a duplication, in which a segment of nucleotides is duplicated resulting in a repetition of the same sequence. This is indicated with “dupl”. Another type of error is an inversion, in which a segment of DNA is reversed, and the sequence of nucleotides is backwards. This is indicated with “inv”. Some of these mutations can be frameshift mutations, that is, they shift the reading frame of the mRNA by one or two nucleotides. If this happens, the nucleotides are no longer read in the correct group of three. This causes the wrong amino acids to be put in place after the mutation point and also, since accidental stop codons can be created, usually causes the resulting peptide to be much shorter. Another type of error is the accidental creation of a splice site where it should not occur. There are certain sequences of nucleotides that signal where splicing is supposed to be. Sometimes a mutation creates a false splice site signal that leads to a mistake in the protein product. The gene mutations that have been discovered for fumarase are listed in the LOVD TCA Cycle Gene Mutation Database. Actually, the preferred term for a change in a gene is “sequence variant”, because not all changes cause disorders, as the word mutation might imply. Some are just harmless variations that can be found in normal people. The database lists the alterations in the usual sequence of nucleotides, and it indicates whether the person was normal or had a disorder such as HLRCC, MCUL, FH deficiency, etc. Each listing of a sequence variant starts with the number of the exon on which it was located (or if it was on an intron, the number of the nearest exon.) Then, in most cases, there is “c.” This stands for “coding DNA sequence”. This means that it is based on the sequence of nucleotides in the coding DNA strand and not, for example, the template DNA strand, an RNA strand, or mitochondrial DNA. In this system, for each exon of the fumarase gene, the normal sequence of DNA nucleotides for that exon has been recorded in a databank. The nucleotides are numbered, and the numbers continue and do not start over with each exon. The nucleotides of the introns are not numbered. (However, in “genomic” sequences, all of the nucleotides in both introns and exons are included.) The number that follows is the number of the nucleotide (or nucleotides) in which there was a change. This is followed by a symbol or abbreviation that indicates the type of change. When the location of the change is on an intron, the number of the closest nucleotide that is on an exon is given, and then there is a plus or minus sign followed by the number of nucleotides away from that nucleotide that the change is located. For example, suppose a mutation is located between exons 3 and 4, but is closer to exon 3, and is located 24 nucleotides away from exon 3. The number of the last nucleotide in exon 3 would be given followed by +24. If instead, the mutation is only 16 nucleotides away from exon 4, then the location would be given as the number of the first nucleotide in exon 4 followed by “-16”. Sometimes genetic testing laboratories don’t use this nomenclature. In the above example, they might use “IVS3” instead of the number of the closest nucleotide. This was the old way of indicating a location on intron 3. IVS stands for intervening sequence, which means intron. If you have received a genetic report indicating a fumarase mutation, you may wish to see the part of the coding DNA sequence in which your mutation is located. 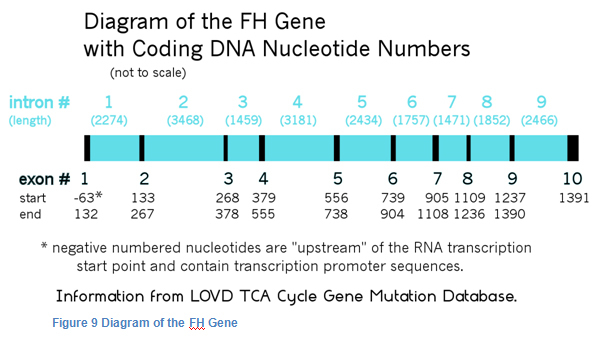 You may do this by going to the LOVD FH Homepage and selecting “Genomic Reference Sequence”, which shows the entire sequence of nucleotides in the fumarase gene, with the amino acids coded for indicated by letters underneath. 02 c.157G>T Nonsense This mutation is located in exon 2 of the fumarase gene. Nucleotide 157 was changed from guanine to thymine. This resulted in the creation of a stop codon where there should not have been one, which caused a shorter protein than normal to be made. 03 c.302G>C CGA>CCA Missense This mutation is located in exon 3 of the fumarase gene. Nucleotide 302 was changed from guanine to cytosine. This resulted in the amino acid proline being put in where arginine was supposed to be. 05 c.671_672delAG Frameshift This mutation is located in exon 5 of the fumarase gene. Nucleotides 671 and 672 were lost leading to a frameshift in reading which caused subsequent codons to be wrong. Fumarase is believed to be a tumor suppressor, that is, its presence prevents the formation of tumors. There are several theories about how fumarase is a tumor suppressor and how lack of fumarase in cells can cause them to become cancerous. HLRCC tumors are often atypical (unusual) in their appearance with large misshapen nucleoli. A distinguishing feature of HLRCC is the presence of large eosinophilic nucleoli surrounded by clear halos. Fumarase is known to be a very important enzyme for energy production in the mitochondria. In the mitochondria there is a series of biochemical reactions that is called the Krebs cycle. (See diagram below.) In the cycle, succinate is converted to fumarate and fumarate is converted to L-malate. The conversion of fumarate to malate occurs because of the action of the enzyme fumarase. If fumarase is missing, then an excess of fumarate accumulates, and the energy producing cycle is blocked. 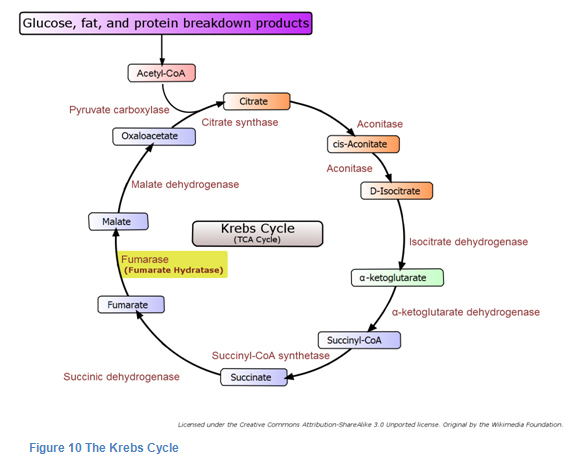 The Krebs Cycle was discovered by Hans A. Krebs. It takes place in the innermost space of the mitochondria and requires the presence of oxygen. Together with the electron transport chain, it produces most of the cells’ energy. One theory of cancer in HLRCC is that the blockage of the Krebs Cycle causes chemicals called reactive oxygen species (like hydrogen peroxide) to be formed. The reactive oxygen species can cause cells to form tumors. A second theory is that fumarase has other important functions in cells in addition to its role in the Krebs cycle. For example, Ohad Yogev, et al, reported in 2010 that fumarase was involved in DNA repair. It was already known that two different forms of fumarase are made from the same fumarase gene. One is sent to the mitochondria for its function in the Krebs Cycle. The other, called cytosolic fumarase is sent to the cytoplasm. Up until recently, the function of cytosolic fumarase was not known. By studying yeast cells it was discovered that cytosolic fumarase plays a role in detecting and repairing DNA damage, particularly double-strand DNA breaks. According to this theory, if cells lack the fumarase they need to repair damaged DNA, they are more likely to grow into tumors. A third theory of how loss of fumarase leads to cancer is the pseudohypoxia theory. There are times when the cells in our body don’t get enough oxygen. This is called hypoxia. The cells have a way of dealing with this that uses a chemical regulator called hypoxia inducible factor (HIF). HIF has the ability to activate genes that protect cells from low oxygen. These genes prevent cell death, promote the growth of blood vessels, increase energy production, and promote cell growth and replication. Some of these genes are: vascular endothelial growth factor (VEGF), glucose transporter 1 (GLUT-1), platelet-derived growth factor (PDGF), transforming growth factor alpha (TGF-alpha), and erythropoietin (EPO). These same genes which prevent cell death during times of low oxygen are also believed to promote tumor growth. When there is adequate oxygen in the cells, HIF is not needed. Cells have a mechanism that keeps it from being produced when it is not needed. HIF is made from subunits, one of which is called HIF-1alpha. When this subunit is in adequate supply, HIF can be made. If it is not available, then HIF cannot be made. HIF-1alpha is constantly being produced, but it is also constantly being destroyed by enzymes called prolyl hydroxylases (PHDs). PHDs must have oxygen to do their job. If the oxygen level is too low, PHDs are unable to destroy HIF-1 alpha, and we say that HIF-1alpha has been stabilized. When this happens HIF can be made from its subunits. After HIF is made, it increases the transcription rate of the above-mentioned genes that increase the growth of blood vessels and help cells survive. In addition to oxygen, PHDs also need to bind to alpha-ketoglutarate (AKG) in order to perform their function of destroying HIF-1alpha. An abundance of fumarate can block the alpha-ketoglutarate from binding with the PHDs. A lack of fumarase for the Krebs cycle can lead to a buildup of excess fumarate, which can prevent AKG from binding to PHDs. This causes the stabilization of HIF-1alpha even when oxygen levels are high. This condition is called pseudohypoxia (false low oxygen). With HIF-1alpha stabilized, HIF becomes abundant and the genes that promote cell and blood vessel growth are perpetually turned on. According to the pseudohypoxia theory, this is a major factor leading to tumor formation. Although stabilization of HIF-1alpha does occur in HLRCC, researchers wondered why HLRCC is so different from other cancer syndromes in which HIF is believed to play the primary role, such as VHL and SDH deficiency. VHL and SDH deficiency both cause paragangliomas, pheochromocytomas, and clear cell renal cell carcinoma. But HLRCC has a different clinical picture that includes uterine and cutaneous leiomyomas and papillary renal cell cancer. Another puzzle was that HIF causes upregulation of vascular endothelial growth factor (VEGF), and anti-VEGF agents are very effective against clear cell RCC, but they are not very effective against papillary type 2 RCC. For these reasons researchers were not satisfied that increased HIF is the primary mechanism for tumor formation in HLRCC. A clue to what might be the cause of papillary tumors came from diabetes research. It was discovered that in diabetics, mitochondrial stress could cause accumulation of fumarate and that the excess fumarate could damage proteins. Proteins can be thought of as chains of amino acids that are bent and twisted into precise shapes, and these shapes are stable because of chemical attractions that form between the amino acids in different places along the chains. One of the amino acids is cysteine. When fumarate is present in excess, it can have a special chemical reaction with cysteine. When this happens, the cysteine is converted into S-(2-succinyl)-cysteine, or 2SC for short. This process is referred to as protein succination. When cysteine is succinated, it can change the attraction between the amino acids that help hold the shape of the protein. This can cause a protein to change its shape, and the change in shape can alter its ability to function. In diabetics, it is believed that the enzyme GADP is damaged by succination of its cysteine residues and that this contributes to some of the complications of diabetes. HLRCC researchers who learned about succination of protein in diabetes suspected that there could be similar protein alterations occurring in HLRCC. In HLRCC, conversion of a normal cell to a tumor cell can occur when a cell sustains damage to its one remaining normal FH gene. After this happens, the cell lacks fumarase so the Krebs cycle is stopped at fumarate, and fumarate accumulates instead of being converted to malate. To understand if succination of proteins by excess fumarate plays a role in HLRCC, researchers focused on a protein called KEAP1. KEAP1 is important because it controls the degradation of another molecule called Nrf2. KEAP1 is shaped a bit like a “V”, and normally the ends of the V attach to both ends of Nrf2 and hold it until it is degraded. If a cell becomes stressed, Nrf2 is released from KEAP1, and it goes to the nucleus where it binds with another protein and then binds to a promoter site on the DNA called ARE (Antioxidant Response Element). ARE is a segment of DNA that activates a group of antioxidant response genes that help protect the cell in times of stress. The researchers suspected that over-activation of some of these anti-oxidant pathways might play a role in the formation of papillary tumors. Researchers learned that loss of the FH gene resulted in the inactivation of KEAP1. They hypothesized that cysteines in the KEAP1 protein were being succinated by fumarate. The researchers discovered that when certain cysteine residues in KEAP1 were succinated, its shape changed so that the arms of the V were more spread out. When this happened, KEAP1 could no longer “grasp” both ends of Nrf2 at the same time, and so it could no longer hold on to it. Without KEAP1 playing its role in the disposal of Nrf2, Nrf2 could accumulate and upregulate the ARE genes. One particular antioxidant whose expression is increased this way is called AKR1B10. Researchers think this gene plays an important role in the formation of papillary tumors. Patrick Pollard and other researchers at Oxford used a mouse model to investigate the cause of tumor formation in HLRCC. They used different combinations of genetically altered mice, including some with two active FH genes, some with only one active FH gene, and some with no active FH genes combined with active and inactive genes for HIF-1alpha and HIF-2alpha. The mice with inactive FH genes developed cystic changes in their kidneys that are believed to be precursors to papillary tumors because these tumors can arise from cyst walls. The researchers discovered that inactivation of FH led directly to the upregulation of Nrf2 mediated antioxidant pathways and caused the cystic changes believed to be similar to those in HLRCC. Furthermore, they were able to show that the cystic changes were independent of HIF and PHDs. They also demonstrated that the levels of fumarate present were sufficient to succinate KEAP1 and thereby increase Nrf2 activation of ARE genes. It may turn out that the resistance of HLRCC tumor cells to the usual cancer treatments of chemotherapy and radiation may be due to the protection of the cells by the upregulated ARE genes. For example, inactivation of KEAP1 in non-small-cell lung cancer has been linked to chemotherapy resistance. The knowledge that fumarate causes proteins to be succinated, led the Oxford researchers to devise staining methods for detecting HLRCC. The staining methods were based on the fact that 2SC is present in HLRCC tumors, but not in other types of kidney tumors. The staining methods involved putting drops of rabbit antibody to 2SC on slides of tumor tissue. This was followed by drops of antibody to rabbit antibody that had either an attached enzyme used for visualization, or an attached fluorescent chemical for use with a fluorescent microscope. When an enzyme was used, a substrate for the enzyme was added next so that areas of tissue containing 2SC became colored. When the researchers tested the stain with a series of patient tumors, the stain predicted FH mutations 100% of the time. There was no staining of non-HLRCC tumors, not even when they tested it on tumors caused by deficiency of SDH, which is another Krebs cycle enzyme. Soon this type of staining will be available to pathology laboratories everywhere so that papillary and collecting duct tumors can be routinely tested. This is so important because many times when there is no family history or other symptoms, HLRCC goes undetected. This new research has suggested many new possibilities for targeting genes and enzymes in the treatment of HLRCC. One possibility is to inhibit the haem oxygenase gene (also spelled “heme oxygenase”). Haem oxygenase is one of the enzymes that is upregulated by Nrf2/ARE, and it is used by HLRCC tumor cells as an alternate pathway to generate energy, since the Krebs cycle is truncated without fumarase. Another possibility is silencing the AKR1B10 gene with specially made segments of double-stranded RNA that are complementary to the gene. Still another approach is to use drugs that greatly increase the production of reactive oxygen species (ROS). This was tried using a combination of cisplatin and bortezomib. All of these methods have shown promising preliminary results in vitro and in vivo. This information comes from articles which have been referenced in Cell Chemistry and Cell Lines and The Future sections. A quick overview as slides. A complete description of HLRCC as a downloadable PDF. Overview of HLRCC with a number of useful links to other resources. The link is to the article abstract. The full article PDF is available on subscription. This document describes fully the current known status of HLRCC, surveillance and treatments. This is an important HLRCC article for giving screening recommendations and current treatments for metastatic RCC. Comprehensive description of HLRCC with many references. This is a short case study showing that HLRCC knowledge has been developing over the last few years. It has 2 useful figures and a good description. The link is to the article abstract. The full article PDF is available on reduced subscription for patients/caregivers. Comprehensive technical description of HLRCC in 33 families in the Netherlands. Comprehensive technical description of HLRCC with a lot of genetic information and 99 references and 3 cutaneous leiomyomas photos. There is a list of possible treatments for painful leiomyomas. Comprehensive description of HLRCC dated 2008 with many links into NIH information. The link is to the article abstract. The full article PDF is available on subscription. This document describes the aggressive nature of RCC in HLRCC. This is a large, highly technical documents of academic dissertations from Department of Medical Genetics Molecular and Cancer Biology Program Haartman Institute and Biomedicum Helsinki University of Helsinki Finland. It is a foundation medical document of HLRCC and is included for reference purposes. Of interest to anyone wishing to have a historically complete understanding of the condition. A paper describing the results of a study of leiomyomatosis on many individuals. The dilemma of screening recommendations is well described. This is one of the original pioneering papers on HLRCC. These are the first papers describing the relationship of cutaneous and uterine leiomyoma with RCC as HLRCC. Information about the earlier median onset age for hereditary kidney cancers to justify earlier genetic testing. This gives an easier to understand view of chromosomes, genes and inheritance. Useful Australian documents describing different aspects of genetics in simple terms. A list of laboratories worldwide that test for alterations to the FH Gene (but in USA make sure they are CLIA certified). In it there is a statement that the Fumarate Hydratase enzyme test is not recommended because of difficulty in interpreting the results even in with a FH mutation analysis. The genetic counselor will complete. Also has a large number of references to technical papers. This Open access article is a detailed technical genetic study of FH mutations. There is an interactive version of this document where colored images of molecules can be rotated(May require a free plug-in for your browser). This describes the database and how data about FH gene mutations is collated. Most people will not easily understand the fine detail which is presented in the database itself. This is a link to abstract, full article on subscription. It suggests that exonic or whole-gene FH deletions are not a frequent cause of HLRCC syndrome. An interesting analysis of the connection between two families in Germany and England to a Polish ancestor. Has a good photograph of cutaneous leiomyoma on the face. Description of the comparison of HLRCC fibroids with fibroids of the general population at the genetic and cell chemistry levels. Analysis of FH genetic mutations in a number of families. This is the widely quoted paper describing that mutations in the fumarate hydratase (FH) Gene are the cause of the symptoms of HLRCC. This article reports that a particular FH alteration was the primary risk factor contributing to Overall Survival of NSCLC patients. This has a comprehensive description of the various cell types of the primary and metastatic sites. A paper showing that that further pathway targets exist specifically for HLRCC tumors. Abstract starts: The hypoxia-inducible factor (HIF) prolyl hydroxylase domain enzymes (PHDs) regulate the stability of HIF protein by post-translational hydroxylation of two conserved prolyl residues in its α subunit in an oxygen-dependent manner. The synergy between HLRCC and VHL is shown in the article. Measurement of a high fumarate level can be useful in HLRCC diagnosis when no FH gene mutation has been found. This is a link to the abstract, the full article is available on subscription. Another article identifying specific targets for treatment of HLRCC kidney cancers. This is a link to the abstract, the full article is available on subscription. This technology from the NIH describes the UOK 268 cell line, spontaneously immortalized renal tumor cell line from a primary tumor that may be of great interest to industry for studying HLRCC, following on the UOK 262 cell line and research on the earlier A549 FH deficient cells. This has a comprehensive description taken from the latest research papers of the current research into HLRCC cell chemistry. This article describes the Krebs Cycle and chemistry , not specifically related to HLRCC. This article is in Chinese Jounal of Cancer and describes a lot of current theories. Researchers in Oxford, UK have found that a chemical compound called 2SC which is S-(2-succinyl) cysteine (termed protein succination) is found only in HLRCC tumors and not in other tumors and is now being routinely used as a low cost, quick screening aid. This thesis An Investigation of Mitochondrial Bioenergetics and the Turnover of Succinated Proteins in the Adipocyte during Diabetes Tanis R, 2014 links research with Diabetes Type II. This article Hereditary leiomyomatosis and renal cell carcinoma syndrome-associated renal cancer: recognition of the syndrome by pathologic features and the utility of detecting aberrant succination by immunohistochemistry. Chen YB, Brannon AR, Toubaji A, Dudas ME, Won HH, Al-Ahmadie HA, Fine SW, Gopalan A, Frizzell N, Voss MH, Russo P, Berger MF, Tickoo SK, Reuter VE.,2014 confirms the testing for 2SC to distinguish HLRCC tumors from others. 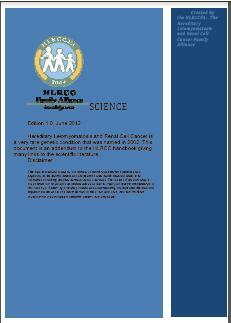 It also has a detailed description of HLRCC kidney cancers. This is exciting new research describing a cell pathway which when blocked in a HLRCC cancer cell will cause that cell to die, but allow normal cells to live. This article describes the development of the first genome-scale network model of cancer metabolism, validated by correctly identifying genes essential for cellular proliferation in cancer cell lines. The model predicts 52 cytostatic drug targets, of which 40% are targeted by known, approved or experimental anticancer drugs, and the rest are new. It further predicts combinations of synthetic lethal drug targets, whose synergy is validated using available drug efficacy and gene expression measurements across the NCI-60 cancer cell line collection. Finally, potential selective treatments for specific cancers that depend on cancer type-specific down regulation of gene expression and somatic mutations are compiled. This includes HLRCC. This technology from the NIH describes the UOK 262 cell line, spontaneously immortalized renal tumor cell line from a metastatic tumor that may be of great interest to industry for studying HLRCC, following on the research on the earlier A549 FH deficient cells. This article describes in vitro and in an in vivo xenograft model that increasing ROS level in HLRCC above a certain threshold can induce HLRCC-tumor cell death. Increasing tumor ROS with bortezomib in combination with cisplatin represents a novel targeted therapeutic approach to treat advanced HLRCC-associated renal tumors. Describes possible treatment of HLRCC by lactate dehydrogenase-A (LDH-A) blockade. A highly technical discussion of cell chemistry. This is a link to the abstract. The full article is available on subscription. It describes the enzyme differences between HLRCC fibroids and non-HLRCC fibroids compensating for the loss of FH. Technical article describing in vivo that pseudohypoxic drive, resulting from HIF1α (and HIF2α) overexpression, is a direct consequence of Fh1 inactivation. The mouse model advances the understanding of biochemical pathways linking mitochondrial dysfunction and tumorigenesis and will allow testing of potential therapies for renal neoplasms. This article describes the Krebs Cycle and chemistry relating to cell death, not specifically related to HLRCC. Gives a news office view of the article. A highly technical discussion of cell chemistry – good schematic diagrams. The enzyme test seems to be unavailable now from most laboratories due to difficulties in interpreting results. Scroll down to technical description and diagram of the Citric Acid Cycle, also known as the Krebs Cycle. The articles referenced in the general section also contain information about cutaneous leiomyoma whereas the following articles are specific. This web site has some high definition microscope photographs showing the pathology of leiomyomas. To view them you will need to sign in with a created account (free). This link provides a full medical description of piloleiomyomas. This link leads into many comprehensive pages on leiomyoma description. All aspects of cutaneous piloleiomyoma are described with 2 good photos. A good description of leiomyomatosis with large photographs. The full text is now only available through subscription. It has some interesting photographs of cutaneous leiomyomas and also describes an occurrence of a benign angiomyolipoma in a kidney. Published in Dermatology. This has a very good description of the physiology of piloleiomyomas and has some good photographs. This article concentrates on pain relief for cutaneous leiomyoma. However there is no mention of HLRCC. This is a link to the abstract; the full article is available on subscription. It describes a rare case of a skin lump being part leiomyoma and leiomyosarcoma. This article describes the condition with 2 photographs and compares different treatment options. This is a link to the abstract. The full article is available on subscription. This article describes the possibility of removing larger areas of piloleiomyomas with surgery. Earlier technical description of HLRCC in Germany, it has a good photograph of a segmental distribution of cutaneous leiomyoma. This link is to the abstract, the full article is available on subscription. Good results from oral Gabapentin for pain relief. This is a link to the abstract; the full article is available on subscription. This describes how some cutaneous leiomyomas may look bizarre like uterine ones. (Bizarreness seems to be a common attribute in many HLRCC tumors). The articles referenced in the general section also contain information about uterine leiomyoma (fibroids), whereas the following articles are specific. These links contains a lot of information about fibroid symptoms and treatments. However some are not HLRCC specific and some treatments may be not recommended for HLRCC. Consult the HLRCC Handbook for its recommendations. Description of uterine fibroids and treatment options. Uterine Fibroids(Benign Tumors Of The Uterus) Melissa Conrad Stöppler, William C. Shiel Jr. Gives information about using ultrasound to destroy fibroids. Up-to-date information for people worried about possible leiomyosarcoma. This study showed that raloxifene is an appropriate medicine to reduce the size of uterine leiomyoma and is more effective than GnRH. This is a link to the abstract; the full article is available on subscription. Follow up of 120 patients from 2005 showing no increase of problems over other more invasive treatments. Morcellation is not recommended for HLRCC and this paper adds to that recommendation. Paper on analysis of study of fibroids for HLRCC females. A comprehensive document which importantly reclassifies previous HLRCC uterine leiomyosarcoma under a new classification protocol to atypical uterine leiomyoma. This article relates to fibroids generally and describes the possible HLRCC connection. The malignant transformation of a uterine leiomyoma to a uterine leiomyosarcoma is rare, 1:200,000 is in the literature, but is a source of worry. This article gives a good description of the subject. Gives descriptions of alternatives to having complete hysterectomies. Please remember to consult the HLRCC Handbook for its recommendations. This article describes that the average age of onset of kidney cancer decreases with each generation. Confirms the recommendations of the HLRCC Handbook. This provides a comprehensive overview of drug treatments and rationales for RCC. This article describes the effect of reduced fumarase activity on RCC metastasis and wound healing. Interleukin 2 (IL-2, Proleukin) can produce a complete cure for metastatic renal cell cancer was described in 2002. The link is to the abstract with the full text available on subscription. A new study showing that type 2 papillary renal cell carcinoma may be the only symptom of HLRCC in some individuals. This study also identified and characterized 21 novel FH mutations. The link is to the abstract with the full text available on subscription. This describes RCC in BHD, VHL and HLRCC, is well illustrated and highlights the need for RCC in HLRCC to be treated with radical surgery. This open access article has a comprehensive analysis of statistics of possible causes of RCC with 127 references. Paper on spontaneous regression of mRCC. These 2 links are to the abstracts, subscription required for full articles. They describe good results from cryoablation (CA) and radio frequency ablation (RFA). These are nephron sparing procedures that destroy renal tissue in situ rather than by surgical removal. However these techniques are not recommended for HLRCCtumors – consult HLRCC Handbook. Discussion of different drugs for treating RCC. This paper describes a break-through in the treatment of metastatic RCC by sensitizing the cancer cells with sunitinib in parallel with radiation therapy. Written for the Kidney Cancer Association and has description of different drugs for treating advanced RCC. General discussion of bilateral tumors for a number of genetic conditions including HLRCC. Targeted treatments for kidney cancers. The link is to the article abstract. The full article PDF is available on subscription. Although RCC is usually found in adults this article describes an 11-year old boy who was diagnosed with RCC on his first HLRCC screening. Useful discussion on screening guidelines. Full detailed technical article covering the suggested causes of RCC in VHL as well as HLRCC. The link is to the article abstract. The full article PDF is available on subscription. Technical discussion of tumor types associated with HLRCC. This has a recommendation for 6-monthly RCC follow-up screening with MRI contrast. The author recommends surgical therapy early in the course of treatment of HLRCC patients instead of wait-and-see management. The link is to the abstract, the full article is available on subscription. There is not a lot of information in this link. Dr. McKelvey’s team conducted a comprehensive case study to better understand the link between HLRCC and male infertility. Male infertility has not previously been linked to this disease. It is of interest to indicate that there may be other conditions associated with HLRCC. An article relating high blood pressure with high fumarate levels for salt related blood pressure. Massive Macronodular Adrenocortical Disease (MMAD) is another rare condition thought to be related to HLRCC. Cerebral Cavernomas is another rare condition thought to be related to HLRCC. The link is to the article abstract. The full article PDF is available on subscription. This describes that some testicular cancer is directly related to FH mutations. This article describes the finding of benign ovarian mucinous cystadenoma in two families with FH mutations (HLRCC and Fumarase Deficiency). This is link to an abstract of an article in English. The full text in French is available on subscription. It is of interest because of indicating a possible link between HLRCC and polycythemia and also myeloid leukemia. This describes fumarase as used in food production. We are what we eat! These are links to research and trials into new techniques which might be relevant to treating HLRCC in the future. This site www.bumc.bu.edu/stemcells describes many of the researches being undertaken. Aim 1. Identification of signaling pathways affected by FH deficiency using phospho-proteomics and subcellular proteomics. Aim 2. Metabolic characterization of FH-deficient cells. Aim 3. Build a predictive and mechanistic mathematical model of the interplay of signal transduction and metabolism. This article identifies another possible therapeutic target for treating HLRCC kidney cancer. This is a link to the abstract, the full article is available on subscription. Treatment with vandetanib/metformin on mice has been very successful and a clinical trial is expected soon. This is exciting new research called S/MAR Plasmid Vectors for Genetic Correction from Imperial College, London. This research was presented at the 3rd International BHD Symposium May 2011. In a breakthrough development, the Israeli company Vaxil BioTherapeutics has formulated a therapeutic cancer vaccine, now in clinical trials at Hadassah University Medical Center in Jerusalem. If all goes well, the vaccine could be available about six years down the road, to administer on a regular basis not only to help treat cancer, but in order to keep the disease from recurring. The first safety trial of 10 patients has encouraging results April 10, 2012. The vaccine is being tested against a type of blood cancer called multiple myeloma. If the substance works as hoped — and it looks like all arrows are pointing that way — its platform technology VaxHit could be applied to 90 per cent of all known cancers, including prostate and breast cancer, solid and non-solid tumors. It may or may not be effective in HLRCC. Published in September 2011 Nature – A new type of cancer treatment that uses a virus to infect and destroy tumor cells without harming normal cells is showing promise in early clinical trials. This is not specific to HLRCC, but shows the work of the great team of world experts in giving us all hope for the future.